Why does event on drag not have any effect with jQuery implementation? 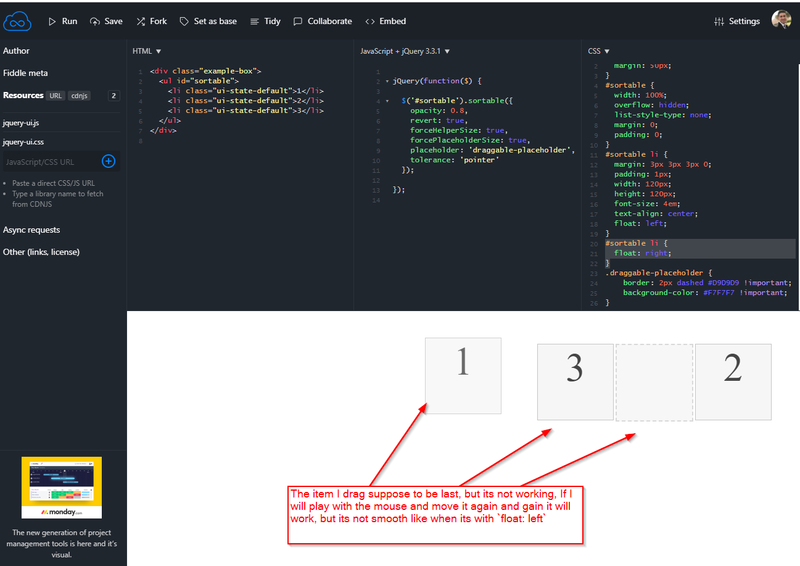 Jquery tooltip customization isnot working, how to handle it? jQuery Sortable dragging is not working smooth when items are float right. I try to fix it without success and I don't understand why it is an issue. To reproduce and understand the issue, you need to try dragging the items and you will see that sometimes you like to place an item at a place and the placeholder is stays at another place. see the attached image to understand better. When removing the float:right property it will work good. I will be happy to get some answers for that. I have a table on my html page made by using angular but mainly HTMl & CSS (see the code snippets down below). Because the tables are probably going to be rather large eventually, we wanted to make the table to be able to scroll. That itself, wasn't that big of a problem, and the table with only one value didn't cause any problems either. After some fiddeling around the second table that has four values, did not want to work with me. I have tried various lines of css that also have been used on the other table. It probably is something really simple that I just can't think of right now. This is the table with only one value, and works just fine. Like I said, it probably is something really simple I am just missing or overlooking. What I would like to see is the table being able to scroll down and up, with a fixed header, the text lined out and using 100% of the table with even widths. I have a bootstrap modal for my page. But whenever I open and close that modal, it resizes my entire page (towards left). See this imageContent shift for better understanding. Whenever I click the filter button the page is resized. (area enclosed in red is increasing as I open and close the modal). Also, refer to this image. Modal pop up. Whenever I open my modal the scrollbar of the main page disappears. Trying to make an exact replica of this page, am kind of stuck on this "text shadow effect"
Tried searching around, was trying to use bottom border but since it's left end is actually a bit more to the right, not aligning with the text, I assumed it was box-shadow. Did some stuff and I can pretty much make the shadow itself but can't put it "behind" the text. Supposed to look like this http://picresize.com/popup.html?images/rsz_kiosk_home.jpg Below is my CSS, .buttonheader is given to a paragraph as a class. Unlike the original, mine has a "white square background" that keeps going over the shadow. I tried "background-color:transparent", no success. I tried to impelement the jQuery-UI plugin to resize a table column via Drag and Drop. I want to create a horizontal menu that is contained by 300px and items can be dragged horizontally if containment space is not enough. Somehow the on drag event is not working, no errors at all, just not working. i am trying to customize my tooltip with jquery. The positionning and add some effect and also customize a bit the design. Tooltip is correctly displayed but when i try to add some effects or positionning, nothing happen. I would like at least css and effect work but nothing happen sadly. // How can I work with the JQueryUI.Sortable object? // plain Element as I want to do manipulate it. I'm building a web application with two full-height columns using Flexbox in Bootstrap v4. Both columns contain a connected sortable list, which can be sorted using jQuery UI Sortable. Whenever I'm moving an item from the left list to the right list, the div scrolls horizontally and all remaining items move out of the window. Any idea on how to prevent the left list from scrolling horizontally? jQuery sortable containment option takes a 'parent' or 'selector' for parent, and makes all the elements inside the parent contained or restricted inside the parent. My use case requires me to make certain elements who don't have a class 'x' can be dragged outside the parent and dropped elsewhere. I want the children with class 'no-containment' to be able to sort outside of parent div.